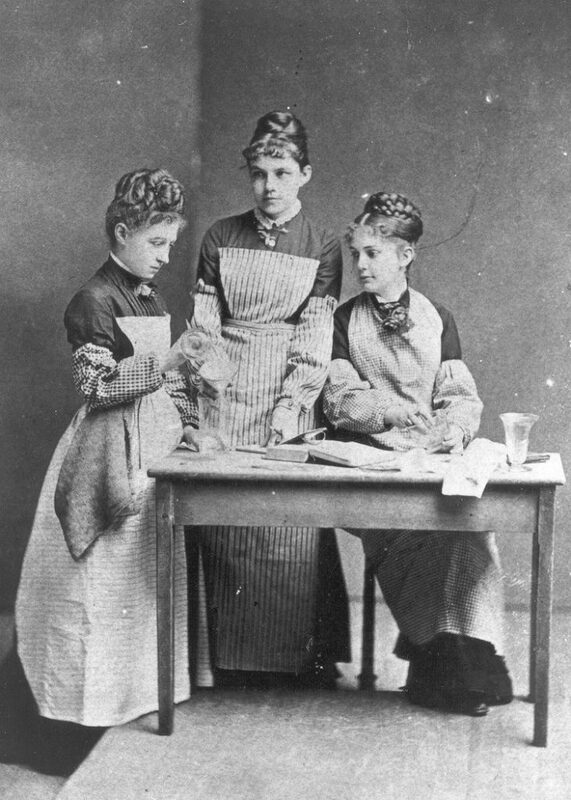 On 13 October, two women – Gertrude Klein Peirce and Anna Lockhart Flanigen – enrolled as special students in the Towne Scientific School (the present-day School of Engineering and Applied Science). Ms. Flanigen was twenty-four years old and had been a student at the Women’s Medical College of Pennsylvania (but apparently not a graduate of that school). Ms. Peirce was seventeen years old and had also been a student in the Women’s Medical College. They were the first women to be admitted to collegiate courses customarily leading to a University degree. As special students, however, Peirce and Flanigen were not eligible for a degree. Both women took courses in the Department of Chemistry. Gertrude Klein Peirce later married Francis H. Easby, Jr., B.S. 1881. In December, the Trustees established the Department of Music and adopted the academic requirements for the Bachelor of Music degree. This was the first academic program at Penn to admit women from the date of its establishment. Six women – A.R. Brown, Eleanor S. Cooper, Julia Catherine Foulke, E.H. Miller, M.H. Sinclair, and M. Wetherill – enrolled in 1877-78 as regular students in the two-year course leading to a Certificate of Proficiency in Music. None of these women earned the Certificate of Proficiency, but they were nevertheless a distinguished group. “A.R. Brown” was Anna Robertson Brown, who, in 1892, would become the first woman to earn Penn’s Ph.D. “E.H. Miller” was the daughter of Elihu Spencer Miller, Professor of Law and Dean of the Law School. “Julia Catherine Foulke” later married a graduate of the College, Henry Carvill Lewis, A.B. 1873. In June, the Trustees closed the Charity School, stating that the public schools of Philadelphia had progressed to the point where they provided educational facilities and teaching comparable to that previously available to the poor only through charity schools. The Trustees re-directed the income of the Charity School trust to collegiate scholarships for young men and to instruction for “female students” so far as the Provost thought appropriate at the University. On 14 September, Mary Elfreth Allen, M.D., an 1876 graduate of the Women’s Medical College of Pennsylvania, became the third woman to enroll as a special student in the School of Engineering. Dr. Allen was twenty-seven years old and lived at 524 Pine Street, Philadelphia. Women are now admitted, in the Towne Scientific School, to the Lectures on Modern History, given to the Seniors, to those on General Chemistry, given to the Freshmen and Sophomores, to those on Physics, given to the Sophomores, and to the instruction in Analytical Chemistry, given to Juniors and Seniors in one of the Laboratories. In February, the Provost reported to the Trustees that “several ladies were in attendance” at the lectures on Modern History given to the Senior Class in the College. On 22 March, Mary Thorn Lewis became the fourth (and final) woman to enroll as a special student in the School of Engineering. She was twenty-four years old and lived at 2224 Green Street, Philadelphia. At the Commencement held on 14 June, the University granted Certificates of Proficiency in Science to Anna Lockhart Flanigen and Gertrude Klein Peirce. They were the first women to complete a collegiate course of study at Penn. The School of Dental Medicine was founded, but did not admit women. The Trustees announced that “persons of both sexes are now admitted” to the classes in English, Classics, History, Social Science, and Speculative Philosophy (or “Darwinism”), in the College; to the classes in General Chemistry, Physics, and Analytical Chemistry, in the School of Engineering; and to all classes in the Department of Music. The Trustees simultaneously announced the establishment of the Bloomfield Moore Fund, the income of which was dedicated to the education of women who planned to become teachers. The Fund was sufficient to support as many as six women in any one year and those who received the scholarship were free to enroll in any of the classes declared open to “both sexes.” The Bloomfield Moore Fund was the first endowment for women’s education at Penn.